This mini gold initial monogram necklace is hand cut out of 14k gold filled 18 gauge sheet and measures 5/8" in diameter. Personalized necklace. Initial Necklace. Gold filled means the gold is about 50,000-100,000 times thicker than gold plating. The front and back will not tarnish and the gold will not wear off. The script monogram has a great traditional look. Other fonts available at your request. 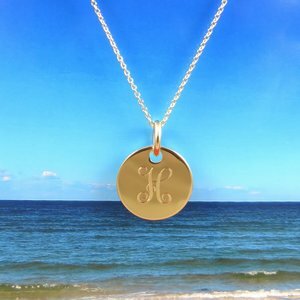 These mini individual initial monogram necklaces make excellent Bridesmaids gifts, Birthday gifts or any other of your favorite occasions. A small message can be added to the back for just $10.00 more. Pendant comes complete with your choice of 16", 18" or 20" 14k gold filled chain and gift box.